Pinterest is a site your business should have on its radar. It's like a virtual bulletin board, allowing users to curate a collection of things they like from around the Internet into various layouts, or boards. And its popularity is booming, with 11 million reported page visits during one busy week last December--a 40-fold traffic increase over six months. Fifty-four percent of Pinterest users are female, according to Compete.com. Most users are aged 18-34, the majority making over $30,000. There are similar services, such as Snip.it, Tumblr, and Instapaper. Yet, Pinterest's secret sauce lies in its minimalistic board layout and the simplicity of letting users pin a product from another user's board or from a website. Adding a pin to your boards is as easy as hitting the Share button in Facebook. If you optimize your site for Pinterest, there's the added bonus that it will become more attractive to users of these other services. With Pinterest, you can create your own categories for each board, allowing you to organize your collection easily into categories like Tech, Home, and so on. In order to be "pinnable", the product or article in question must have a picture. People can add pins to their board through the Pinterest iPhone app or by installing the Pin It button on their browsers. You must request an invitation to join (which arrived in my inbox quickly), or request an invitation from a friend. Unfortunately, you can't create a board specifically for your business, as it's against the Pinterest Terms of Service. Since Pinterest is image-based, it's essential that you have excellent product photography. Have a look at Georgian Jewelry for examples of gorgeous product shots that draw in the consumer. Yet, pictures don't have to be huge. While Pinterest doesn't give a hard limit, I've been able to pin images with a width as small as 116 pixels. You can add a Pin It button to each of your product or article pages, which makes it much easier for a Pinterest user to pin your stuff. 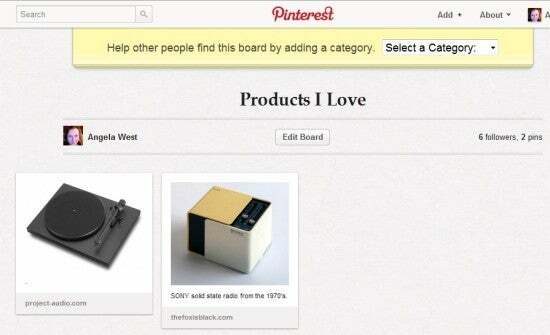 Pinterest recommends adding a description to each pin to make it easier for their users to add it to their own boards. To create the button, scroll towards the end of Pinterest's Goodies page and fill out the form you'll see for making your own button. It's worth joining Pinterest and test-driving it just to pin content from your company's site. If there are snafus, you can tweak your site. For example, a big retail website like Neiman Marcus should be accommodating Pinterest users. But when I tried to pin content from its site, I got pictures that have nothing to do with the product I meant to pin. Is it worth it to overhaul your website based on Pinterest? If you're Neiman Marcus, absolutely. If you're selling building materials or something else that isn't visually attractive, however, it shouldn't be high on the priority list. If you sell any consumer products, especially online, optimizing for Pinterest should be at the top of your list. It's one of the only remaining sites that doesn't rely on ad spending to help get a product noticed; all you need is a good picture and an attractive product. If your product gets discovered on Pinterest, it could lead to a lot of "re-pins" and increased sales.